There are still tickets, and they're only $5!!! 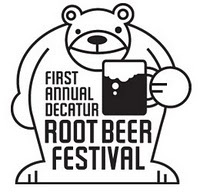 This is a ticketed event because we want to make sure that everyone who attends has a good experience ... and plenty of root beer. As of right now it appears that tickets will not sell out, so you can come the day of the event. There are two time options: 2 to 3 p.m. and 3 to 4 p.m. To see a complete list of the thirteen available beverages to sample, click here. Abita! Mmmmm. Jones! Mmmmm. Sprecher! Mmmmm. Diane Has Actually Read Two Books in One Week!